We have built a reputation by providing high quality and quick delivery at a competitive price. The main advantage of CNC grinding, whether it is between centres, chuck or fixture application, is the ability to perform multiple operations in one set-up. Our CNC Jones & Shipman grinders can grind a number of O/D’s on a stepped shaft in the same operation, or likewise multiple bores, thus achieving perfect concentricity while dramatically increasing our efficiency, and allowing us to reduce cost to our customers. CNC Universal Grinding Facilities: These CNC Grinding machines are used mainly for volume production work to meet the rigorous demands and exacting requirements of high production grinding. Both fitted with universal swivelling wheel head for external and internal grinding. Conventional Universal Grinding: We can also offer conventional universal grinding facilities. Both with drop down internal spindles. Abrasives: We offer a range of abrasives to suit material types and finishes including both manufactured and natural abrasives such as corundum, diamond, silicon carbide and aluminium oxide. Profiled grinding wheels are also available. With our fully trained grinding technicians we can provide a complete hassle free reclamation service if required. You provide us with a worn component a we will return it back to ready for re-fitting or re-assembly. 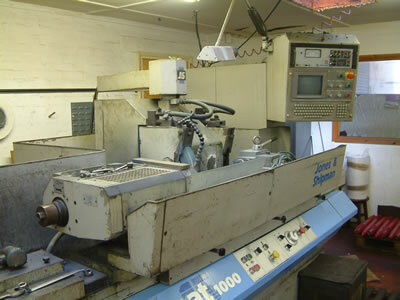 Alternately we can just carry out sub-contract grinding of un plated / metalsprayed items. In both cases we provide excellent surface finishes with extremely tight limits as required.